Since the Community Claws LEOs Club was formed in 2015 (chartered by the Liberty Lions Club, District 2-S2), the LEOs have never stopped moving to provide service to the community. In December 2015, they provided face painting at Country Christmas at Liberty Center and at the Elks Lodge for the Jingle Bell Ball. They also wrapped Christmas gifts for the guests of the Jingle Bell Ball. LEOs sold hot dogs, nacho cheese chips, Gatorade and cokes at Liberty High School to raise club funds. Club President Sara Reiss designed their club shirts shown here. Their 2016 calendar of events has kept the same pace. They gathered donations of personal hygiene items to make care packages for the homeless. Not only did they deliver the care packages, but they traveled to “Some Other Place” shelter volunteering to prepare and serve meals to the homeless. This was s life-changing experience for many of them, as they relayed their story to the Liberty Lions Club later. 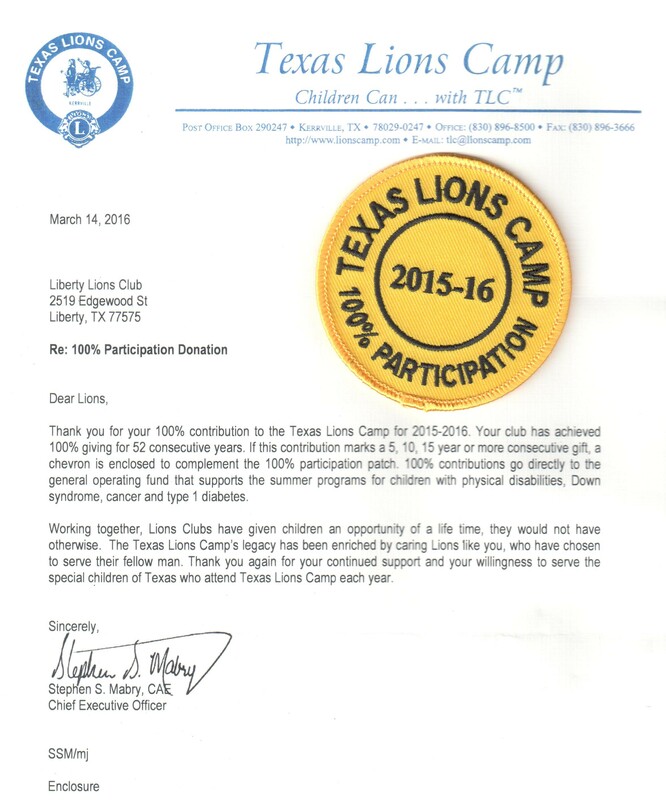 The Liberty Lions Club recently received a patch for their banner recognizing 100% club participation in donations to the Texas Lions Camp. The letter acknowledged the club has held this prestigious honor for 52 years consecutively.